Collecting diagnostic information for VMware ESX/ESXi using the vm-support command. VMware KB 1010705. Make a note of LUN’s Unique ID. Call "HostDiagnosticSystem.QueryPartitionCreateDesc" for object "diagnosticSystem-3869" on vCenter Server "vCenter.vStrong.info" failed. I got the same error message when I tried to configure Shared Diagnostic partition in two vCenters, although configured in similar way, using two different VNX storage arrays. I logged a call with VMware but they could not get it sorted and suggested to configure Share Diagnostic Partition via CLI. OK, lets configure Share Diagnostic Partition via CLI. This is much more interesting way of doing it and the REAL reason to write this article. Using the partedUtil command line utility on ESX and ESXi, KB 1036609. On any cluster host run the following commands. attribute – common attribute is 128 = 0x80, which indicates that the partition is bootable. Otherwise, most partitions have an attribute value of 0 (zero). How to calculate startSector and endSector? Well, startSector is easy – it is 2048. endSector = startSector + (partition_size_in_MB * 1024 * 1024 / 512). WOW, too much calculations! But on a plus side you can get really creative! The size of coredump partition for a single server is 110MB, which is 225280 sectors. You can slice the LUN into multiple diagnostic partitions and then configure hosts to use them individually! Luckily, ESX host will be happy to use shared diagnostic partition between multiple hosts and will not overwrite each others coredumps, see screenshots bellow. To make your life easier, lets just create a new VMFS datastore on this LUN, make a note of the startSector and endSector, then delete it and re-create partition as vmkDiagnostic. /dev/disks # partedUtil setptbl "/vmfs/devices/disks/naa.6006016055d02c00c0815b17cc78e111" gpt "1 2048 20971486 9D27538040AD11DBBF97000C2911D1B8 0"
set Set the specific VMkernel dump partition for this system. This will configure the dump partition for the next boot. This command will change the active dump partition to the partition specified. -e|–enable Enable or disable the VMkernel dump partition. 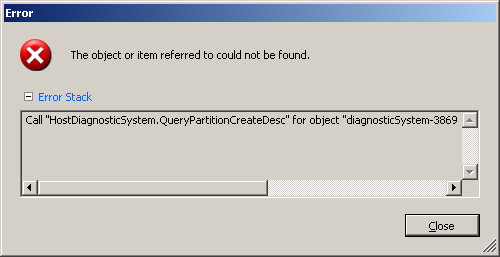 This option cannot be specified when setting or unconfiguring the dump partition. -s|–smart This flag can be used only with –enable=true. It will cause the best available partition to be selected using the smart selection algorithm. -u|–unconfigure Set the dump partition into an unconfigured state. This will remove the current configured dump partition for the next boot. This will result in the smart activate algorithm being used at the next boot. esxcli system coredump partition set --partition="naa.6006016055d02c00c0815b17cc78e111:1"
You need to run these commands on each host. Q: How to manually initiate PSOD (Purple Screen Of Death)? Next two screenshots are PSOD from servers configured to use Shared Diagnostic Partition. In this example 2GB shared diagnostic partition was configured for all hosts in the cluster. As the coredump size is less than 110Mb, there are 20 slots on 2GB partition. Restart/cold boot the host and, when it comes back online, use the vSphere Client or vm-support command to copy diagnostic information from the host. For more information, see Collecting diagnostic information for VMware ESX/ESXi using the vSphere Client (653) or Collecting diagnostic information for VMware ESX/ESXi using the vm-support command (1010705). It is possible to re-copy the contents of the Dump Partition to a vmkernel-zdump-* coredump file. This may be necessary if the automatically-generated file is deleted. For more information, see Manually regenerating core dump files in VMware ESX and ESXi (1002769). I had to rebuild a couple of hosts in a cluster where a Shared Diagnostic partition was created and configured (a LUN with vmkDiagnostic GUID partition, masked to a host) and even though the host was configured to boot from SAN and therefore had ‘local’ coredump partition, it ‘choose’ to use shared diagnostic partition!